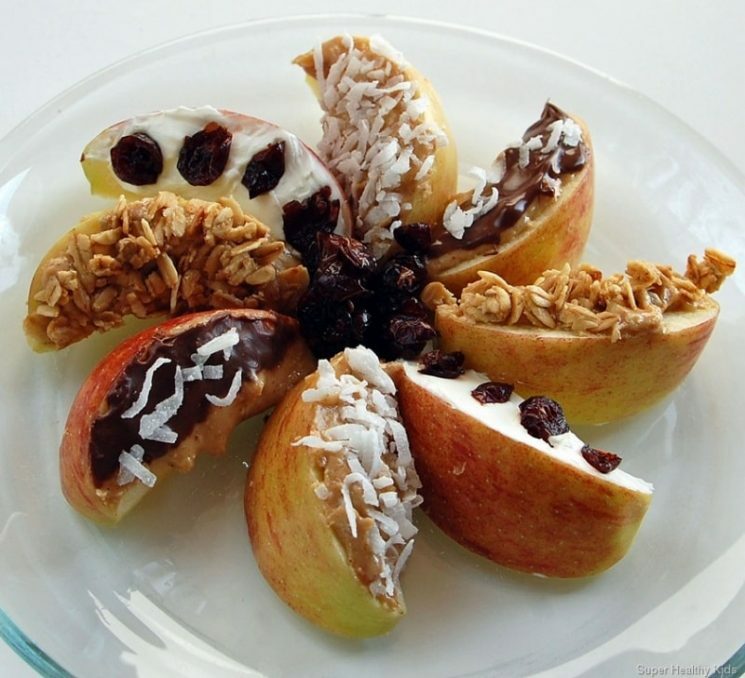 Healthy candied apple slices can make the most delicious dessert or snack! If we could teach our kids that fruit makes the perfect treat or dessert, they would be so much healthier! Fruit, with its natural sweetness, fiber, low calories, and variety of minerals and vitamins, are just the dessert they need. There have been several summers where we’ve taken in a student from Japan. I always ask so many questions about their dietary habits from home. I’ve had a few mention they have dessert every single day. When I ask follow up questions, it usually comes out that what they are referring to is actually fruit (and not the desserts we typically talk about here in the US) The fruit is apparently plenty sweet for them, and they consider it their daily dessert. I just love that! These apple slices make a sweet and delicious dessert or snack. You can incorporate a variety of toppings and flavors and let the kids really make them their own. Sometimes, I’ll use a tiny bit of chocolate, but even that contains some beneficial antioxidants. 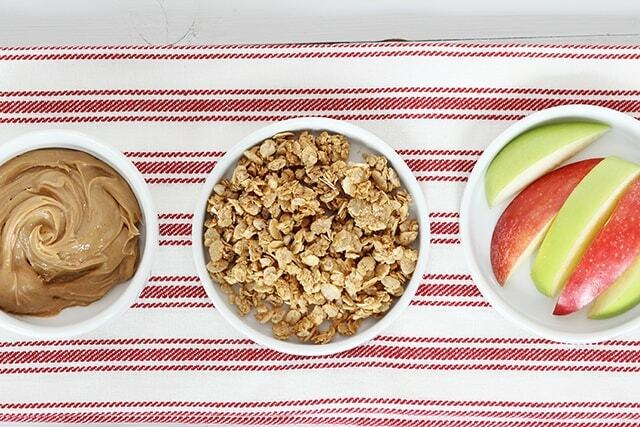 What toppings would you put on apple slices? Peanut butter: Peanut butter is great because it balances this snack with some protein from the nuts. You can make your own peanut butter, or find some commercial peanut butter that has one ingredient: Peanuts! Almond butter: Like peanut butter, almond butter also includes protein, and makes a great dip or spread for apples. We have a recipe for “Gourmet Almond butter” which you’ve got to try! Yogurt: We like flavored fruit yogurts, but plain or vanilla also taste great on apples, depending on what your toppings will be. Sunflower butter: If your kids have an allergy to nuts, or you just want to try an alternative, this Cinnamon Sunbutter is out of this world! Pecan butter: Try this pecan butter for a different dip or spread! Soak in a bowl for a few minutes with cold water and a few drops of lemon juice. Dry thoroughly before attempting to put on any spread . 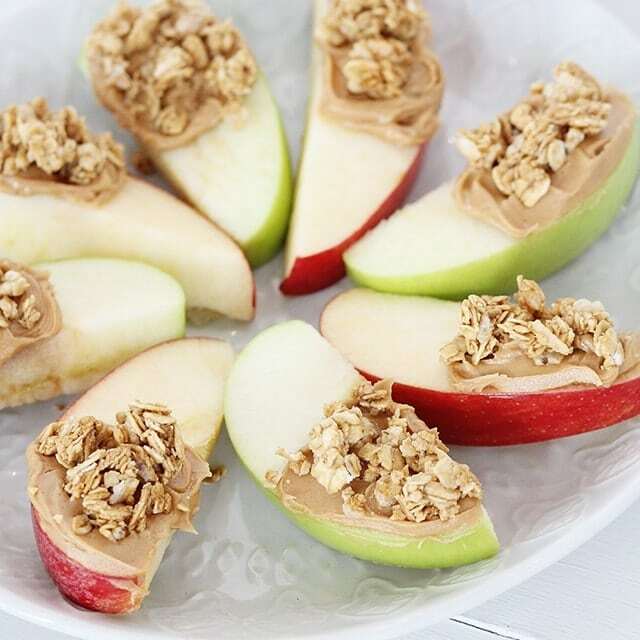 Spread either all natural peanut butter, or cream cheese on each apple wedge. 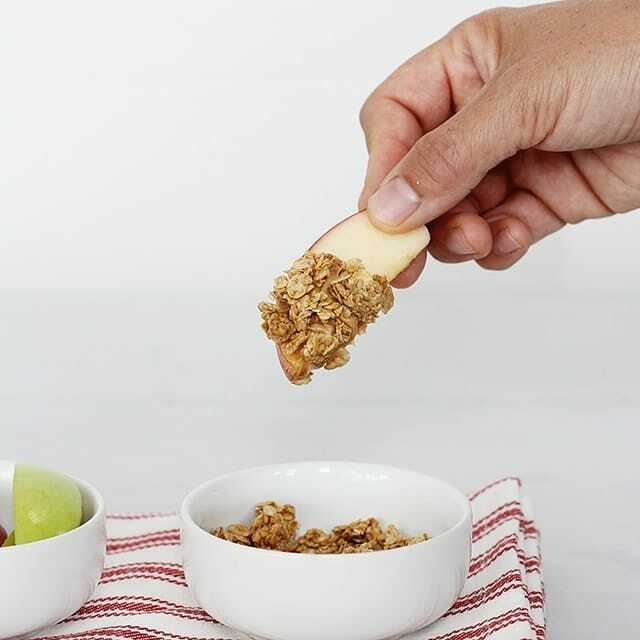 So, the next time your kids think they need dessert, and you just don’t want to teach them that they need cake or cookies after dinner each night, break out the apple slices! Set up some fun mini bowls with different toppings and spreads and let them create their own masterpieces! 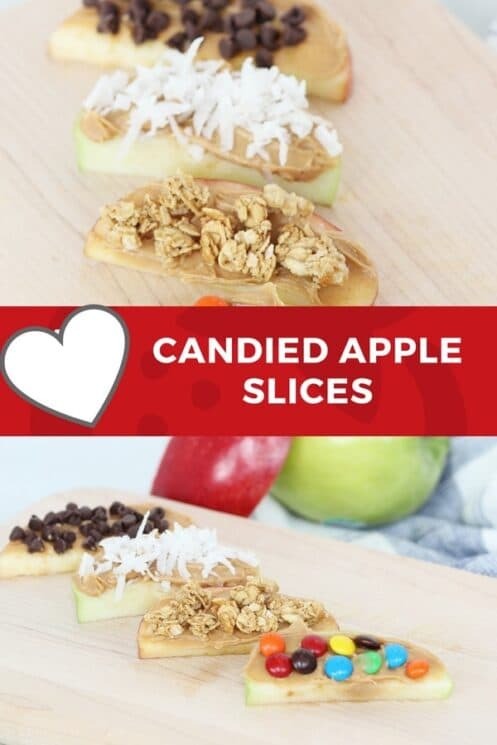 What other toppings would you put on these apple slices? Core apples and cut into slices. Spread each slice with peanut butter and sprinkle with granola. They look delicious, my kids would love that!! You always have great ideas and thanks for sharing them! Which raw dessert cookbook do you have? I don’t have any, but want to get Faves by Melissa Chappel! I think in keeping with the underlying theme of your recipe names (think Coco-Nutty Balls) this dessert should be called Apple Wedgies. ROFL! I’ll hire you to name recipes for me! These look and sound yummy. I never thought about cream cheese before with apples. We have only dipped ours in peanut butter and on New Year’s Eve it’s our tradition to have “FUN-DU” night and we have chocolate syrup, carmel syrup, whip cream and peanut butter. I will have to see what the kids think about the cream cheese. Thanks for another good idea. Thank you for sharing this idea! 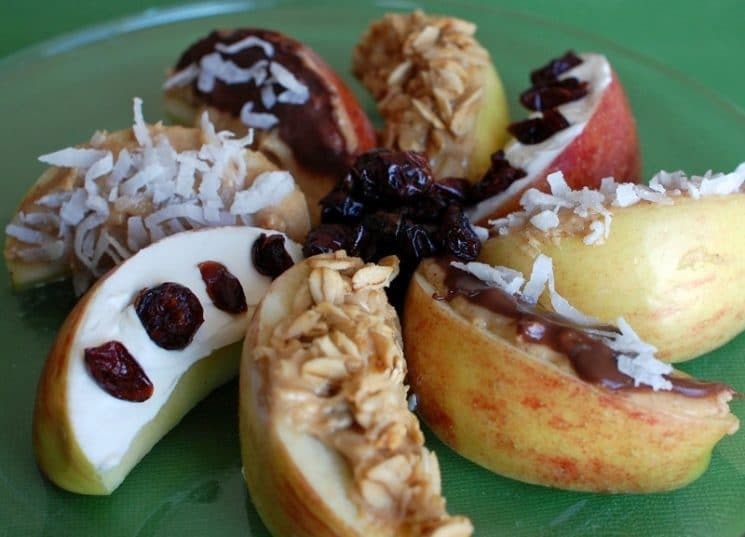 My kids love the apples with peanut butter and raisins stuck in, ants on a log as they call it since they dont like celery. I love the pinwheel look on the plate, that would totally appeal to my little girl. I am going to try the other toppings you suggested too! I know this is an old post, but I’m wondering if Nutella would be good on these? Yes! It would be delicious! That would taste amazing Laura! What did you use for chocolate? We actually used melted milk chocolate chips.. I know it’s not the healthiest way, but that’s what we used. But dark chocolate would be super healthy! I am just not sure why people think recipes like this are healthy. They are packed full of sugar, preservatives and unnecessary junk. Teach your kids to eat fruit straight up don’t load everything with sugar. Unbelievable.